Looking for the best 3D printer for miniatures? Below is a list of the 5 best 3D printers for 28mm, D&D minis, terrains and so on. Overall, we recommend the Ultimaker2+ if you want finer detailed minis or the Hictop CR-10S if you are looking for something affordable without compromising a lot on the detail. Using 3D printers to print game miniatures is popular today and there are many people devoted to the hobby. More people are likely to get into the hobby as 3D printer prices continue to drop. With the right printer, you can design great 3D printed miniatures. The printers can enhance the quality of your design and help you create better games. Today’s 3D printers for miniatures are reliable, easy to use, and of high quality. There are various 3D printers you can use to print miniatures at home. The best 3D printer for figurines and miniatures produces models with details. With the right 3D printer, you can print your own figurines and create new games. If you don’t want to design figurines from scratch because it is too difficult, you can download models from sites like Thingiverse. After downloading a design, you can print it right away or edit it before printing. Below are examples of 3D printed miniatures that you can create. You can download these models for free thanks to the skillful Dutchmogul. To get a similar level of detail as in the miniatures above, there are some qualities you should go for in a 3D miniature printer. To create your 3D miniature, a heated plastic is extruded through a hole. The hole is the nozzle diameter. Make sure the nozzle size of the printer is not above 0.4mm. You should consider the accuracy of the printer head movement in X and Y direction. The layer thickness refers to the height of each layer of heated plastic that is used to create a 3D figurine or miniature. To get more details on the design, the layer thickness should be low. However, a low thickness means that the build will be slow. To print an accurate miniature, you need a printer that is 100 microns (0.1mm) thick or less. The most common materials used in FFF printers are ABS or PLA. To achieve a good finish on the surface, you should post-process after the part is built. If you use ABS plastic, you can sand and vapor bath the miniature in Acetone to achieve a smooth finish. When you want to start 3D printing gaming miniatures, consider the size you would want the minis to be. A 28mm (~1:58 scale) or 54mm (~1:32 scale) miniature can be made with an FFF printer that melts a plastic filament. To make a smaller miniature, you’ll need an SLA Resin printer that uses liquid resin and solidifies it. An FFF printer will work if you want to make popular scale miniatures that are 28mm (~1:58 scale) or 54mm (~1:32 scale). Creating smaller miniatures will require a Resin printer. In addition to figurine, you can print larger models. Printing large models such as houses, huts, castles, trees, and tanks requires expensive 3D printers. It is better to choose to do a print that has quality than one that is large. You can always split larger models when printing them, and join them together later. It’s exciting to find out the best way to divide your miniature and put the parts together in order to get the best result. To learn how to print 3D miniatures, check the guide here. 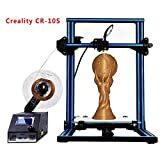 UPGRADE: CR-10S updated with dual Z axies leading screw rod which make printing quality better and more stable, with different mainboard and firmware from CR-10. FILAMENT MONITOR: CR-10S mainboard with filament alarming function, this function can detective if filament is running out or not. In terms of price and quality, the Hictop CR-10S is one of the best and most affordable budget 3D printers you can find. The Prusa i3 design was used as a base to design the Hictop CR-10S. The Hictop printer is designed with quality materials for the power supply, motherboard, and motion systems. The metal frame is designed in a rugged manner. Hictop printer looks like a kit printing machine and only requires a little level of assembling. The assembling involves using four bolts to fasten the two main frames together and joining the wires. You should be ready to start printing within one or two hours. The ‘S’ at the end of CR-10S signifies that it has two z-axis lead screws and stepper motors. The extruder moves more accurately thanks to the dual axis system. This makes the print more precise and continuous. This is why the Hictop is the best 3D printer for gaming miniatures that are detailed and with little flaws. The Hictop 3D printer has a device that detects filaments. The devices will warn you if the filament is about to finish and stop the printer from working. This helps to prevent your prints from getting damaged if the filament is exhausted during a print. This feature is important if you want to print a huge model and do not have time to watch it from start to finish. The Hictop is reliable if you want to print in PLA and ABS. Using ABS and vapor treatment will ensure you get smooth looking miniatures. 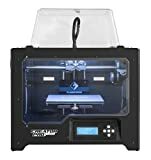 3D printers that are in the category of CR-10 are popular. Therefore, there is a lot of information on the internet if you happen to have any issues with your CR-10S. You can further improve the functionality of the CR-10S on your own by printing brand new bed level adjusters. You can also print a fresh extruder fan duct and a fully automated bed leveling. The Hictop CR-10S is a great and affordable 3D printing machine. It provides quality prints that make it, without a doubt, the best 3D printer for miniatures. The makers of FlashForge 3D Printer Creator Pro took inspiration from the Makerbot Replica. Metallic supporting arms of the build plate. Therefore, the build plate is stable during heating and stays still during a build. The Central Processing Unit (CPU) can install Sailfish firmware, which allows you to auto level. The CPU helps to regulate heat and produces higher print quality. The above features make the Creator Pro the best 3D printer for miniature terrains. Because the frame is covered, there are fewer issues using the ABS filament to print. You can now enjoy printing 3D miniatures using ABS. With the Creator Pro, you can print double colors of filament simultaneously. Therefore, you can make complicated minis. Since the Creator Pro is based on the Makerbot Replica, there is a lot of information about the printer online. Check out the full review of the Creator Pro here. The Ultimaker 2+ is a high-quality printer that can be used to print D&D miniatures. Its build plate has a Z positional precision of 5 microns while the Extruder position measures at 12.5 microns on the XY plane. Ultimaker 2+ has a high level of accuracy thanks to the quality materials used to make it. Its high-quality prints make it the best 3D printer for D&D minis. However, getting a quality print from the Ultimaker2+ takes time. If you wish, you can set it the Cura software to get a lower quality of print faster. You can also use the standard setting to get a reasonable quality at a reasonable speed. The 3D printer comes with the Olsson Block Kit, which you can use to change the nozzle size. The kit has four nozzles, ranging from 0.25 to 0.8mm. Therefore, you have choices between quality and speed. The Ultimaker 2+ is one of the best printers when it comes to filaments. The 3D printer has no problem handling components like PLA and ABS. It can also print ground wood and metal, nylon, and Ultimaker’s CPE, which is like ABS but without the harmful smoke. The 3D printer for D&D minis measures 8.5″ x 8.5″ x 7.9″. To print large models with the Ultimaker 2+, you have to divide the model into various parts, print and then joining them together with the appropriate adhesive. The Ultimaker 2+ is recommended if you want to print detailed miniatures or those that are small in size. The printer produces beautiful and elaborate models. For a full review of the Ultimaker 2+, click here. 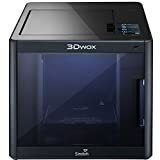 If you are looking for a long lasting 3D printer that can be used for unconventional work, you should go for the Sindoh DP200 3DWOX. It is the best selection if you want to produce three-dimensional minis and figurines. The Sindoh has a quality build on a fused filament fabrication printer. The quality of the models that the printer produces makes it the best printer for figurines. The build bed is covered with Al Polytetrafluoroethylene. The resolution is 50 micron (0.05mm). It has a high-efficiency particulate air filter and a covered build chamber that is good if you want to print with ABS filament. It bed leveling is aided. It has an easy-to-use filament cartridge chamber. The Sindoh performs extremely well when printing minis. One negative about the Sindoh DP200 printer is that it can only use the manufacturer’s filament. Therefore, you will pay more money to buy cartridges because you can’t use any other type of cartridge. Moreover, its cartridge is expensive compared to the common ones. The limitation of having to stick to the manufacturer’s filament is however not a big issue because the printer has other great characteristics, unlike is the case with the XYZ da Vinci Jr printer. The Sindoh DP200 printer has an edition that solely uses Polylactic Acid; it is called the Sindoh DP201 3DWOX (for a full review of the DP201, click here!). The similarity it has with the DP200 is that its specs are identical. The difference is that it cannot be used in printing ABS and the price is lower. This will be a good choice for those who want to use the DP200 without ABS. Using SLA to print helps you get minis of a very good standard. SLA also helps you print minis that are below 28mm. One great thing about this printer is that the price is as low as that of a laptop computer. SLA printing is different from FFF printing because it makes liquefied resin thick using a UV laser. Building the part involves the part rising from the bath of resin. Stereolithography printers used in industries are now available for people to use at home. 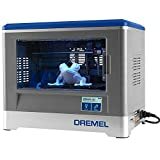 The Dremel Digilab printer performs well and prints high-quality 28mm miniatures as the machine used in industries. But unlike the industrial printers, the home printers cannot print more than a length of one meter. The amount of time used to build an estimate of 2cm in height is one hour when likened with an FFF print that uses a resolution that is huge. Its build time is faster than when you are using FFF to print. Superior part finish with little, if any, post-processing required. The Digilab printer is great SLA printing machine. It is easy to use as all the necessary settings have been put in place for the user to print. From reviews on Amazon, this is a dependable printer that always works. With the printer, you can use resins to make molds for investment casting. This is can also be used to make jewelry through casting metals. It is expensive. You need to renew the resin because it gets old over time. $200 will give you two tanks of resin that can produce 200 to 400 minis. Resins require care. Make sure you build only after the air balls that emanate from adding resins in the tank are gone. You should clean the tank thoroughly when you are done with a build to remove cured resin which can affect a future build. After a build, put on latex gloves and clean the printer with Isopropyl Alcohol. This will help take away uncured resin. To print very good minis that have the smallest of details, you should go for the Dremel Digilab printer. Read the full review of the Dremel Digilab printer here. If you don’t know the printing machine to use to print quality minis, use the Ultimaker 2+. It is a heavy duty printer that is dependable and will give you the best results. With this printer, you can print on different materials, making you able to print more types of design. The Ultimaker is quite expensive. If you need something cheaper, go for the Hictop CR-10S. However, keep in mind that you will not get the most elaborate details with the Hictop. Enjoy printing miniatures with 3D printers!